I made these cacao surprise truffles kinda last minute for us to enjoy on Valentine’s Day and we ended up eating the whole batch that night. These are perishable and best not to store in the fridge for too long, so we had to do what we had to do. There’s also just the part about these being incredibly delicious and decadent. If you don’t already know, the secret ingredient is avocado! It makes these truffles incredibly creamy and adds to the richness. Hooray for healthy fats! Make sure you use a ripe avocado when making these though, otherwise they’ll taste kinda green. It doesn’t have to be overly ripe, but ripe enough and ready for eating. Also, as some of you know, Jesse and I floated in a sensory deprivation tank yesterday evening. I will be recapping about this experience. In a small saucepan over medium-low heat, melt the coconut oil. Add the raw honey, cacao powder, cinnamon and cayenne. Once honey is dissolved and mixture is combined, remove from heat. Stir in the vanilla extract. Peel and pit the avocado, and add to a food processor or blender. Process until nearly smooth. Then, add the chocolate mixture and process again, until smooth. Scrape down the sides and re-blend as needed. Alternatively, you can mash the avocado by hand with a fork (get all the lumps out) and then stir in the chocolate. Scrape chocolate avocado mixture out and into a bowl (unless you made it by hand, then you can keep it in the same bowl) and place in the refrigerator to chill for about 25-30 minutes. Once chilled, scoop out tablespoon-sized balls and roll between your hands to form a truffle (note: this part is messy and sticky!). Place each truffle on a foil or parchment paper lined plate. Chill in the refrigerator about 5-7 minutes. 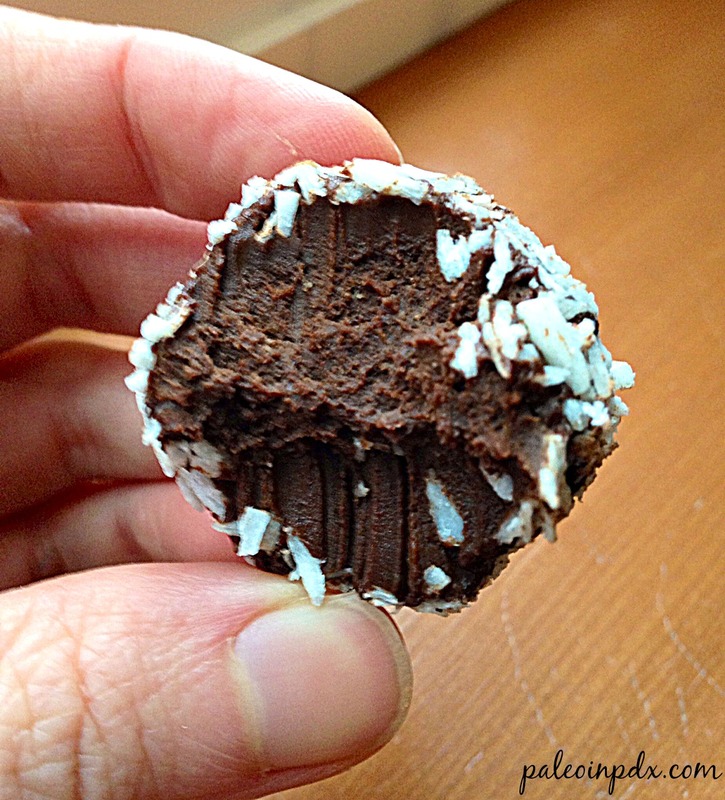 Remove from fridge and smooth out any rough/fuzzy looking spots on the truffles with your fingers. 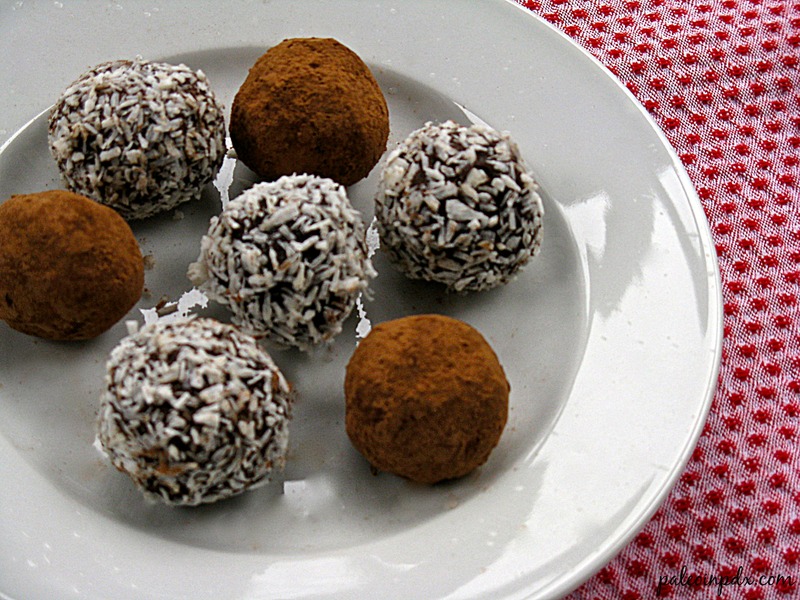 Then, roll half in cacao powder and half in unsweetened coconut shreds, or other toppings of choice. Previous Post: « Italian Sausage "Fettuccine"
These look amazing!! I definitely have to make them. Thanks, they’re pretty incredible! Avocados never cease to amaze me. They really look amazing! How long do you think they can be kept in the fridge? Thanks, they’re quite tasty! They’ve never lasted in my fridge longer than 1 day, so I can’t say for sure. I would probably only keep them in the fridge 2-3 days max though. It’s mashed ripe avocado, so they’re perishable and I think any longer than that and the flavor will change or diminish. I made these last night. OH. EM. GEE. – I am a addicted. I keep mine in the freezer and allow them to defrost 5 minutes before I eat them. They’re great this way on a hot day! It also makes it a little more difficult to eat the whole darn batch…because, lets be honest, I want to do that too! I did find that when I was making them I had to put the batch into the freezer for 20 minutes so that they were hard enough to roll into little balls and not get it all over my hands. I don’t know if that’s because I added too much or not enough of an ingredient, or because it’s hot summer weather here. In any case, they’re still yum! I think I’m going to gather some more ingredients to roll them in and make another batch. Oh yes!